Hall and Laury Opticians, established in 1930, is a full service optician. With state of the art equipment and a fully licensed staff with over 40 years of experience we can help you with all of your eyeglass, optical and lens needs. Eye exams are conveniently performed on site by two contracted eye doctors. 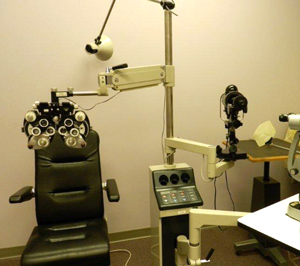 Our 2000 square foot facility offers a full optical lab, refraction room, and a contact lens room that are fully handicap accessible on one floor. We are open six days a week or by appointment for eye exams and servicing of your eye glasses. Our state of the art digital equipment includes a digital pupilometer and a Shamuir fitting system. The in house lab allows us to repair both metal and plastic glasses as well as the ability to weld, fit and reshape your glasses. The digital equipment specializes in precise lens edging and mount lenses and allows us to have on site industrial fitting and dispensation of glasses.